Being a mom is not easy. And being a mom in the spotlight is difficult. But celebrity moms just have to deal with the fact that a lot of their parenting mistakes, mishaps and screw-ups will be totally visible to the rest of us mortals. It's something they just have to live with. Surely every mom has made a mistake here and there - we also think it's kinda hilarious and extremely relatable to see all these glam divas just be human. Besides, hopefully, some moms out there will learn a thing or two from these mistakes, and do better. Also, seeing that all the money in the world doesn't make one a good parent is kind of a relief to all of us, and in that sense, we are thankful to these celebs for sharing their parenting mishaps with us. From Kim K to Queen B, here are 25 celebrity moms who forgot motherhood is a full-time job and sorta just treated it like a hobby. Let's kick the list off with a Kardashian who may have forgotten she is a mom for a second there. And a second is surely enough for a kid to get into some kind of trouble, or even worse, hurt themselves. Which is exactly what happened to little North here, she, unfortunately, tripped and fell. Pretty much a full face-plant, judging from the pic. Now we're not saying Kim is a bad mom, but sometimes taking your sunglasses off and paying attention to your child's safety by walking behind them - not in front of them - is important! We have all witnessed Britney's hard times (aka her 2007 breakdown) which is why we generally don't judge her too hard, but this image makes it really hard for us not to. She's driving a car with her son Sean in her lap, who's visibly still a baby there, no safety belts on, and only one hand on the steering wheel. Parenting isn't a hobby and Britney eventually learned that - she's way better now, but we still had to include her on this list, because her behavior here is just ridiculous! Let's move on to one pop diva to another. Here's Shakira who for some unknown reason thought bringing a newborn baby to a full, huge and very very loud stadium would be a great idea. We get it, she wanted to support her husband Pique, and she brought both kids, but honestly, nannies exist for a reason and if anyone can afford them it's celebrities. This would have for sure been the right time to leave the newborn with someone else for a couple of hours. Here are Courtney Love and her late husband, musician and rock legend Kurt Cobain with their beloved daughter Frances Bean. No big deal right, except for the fact that the two thought it would be a great idea to bring a baby to a crowded red carpet event. Another very obvious case of parenting being treated like a hobby, but hey when it's rockstars such as Courtney and Kurt we kinda just have to accept it. Besides Frances Bean turned out totally fine, so no harm done here. Katie Price is definitely a very controversial celebrity mom, and in the pic above you can see her daughter, 10 years old at the time, wearing a full face of makeup. It is debatable when to give a child the freedom to explore makeup, but this whole look at the age of ten might be a bit too much for most of us. Then again, Katie has always been doing things her own way and raising her daughter whichever way she wants. There's just something so sad about seeing celebrity kids be miserable at red carpets. We get it, the parents want to show them off and introduce the child to their world of glitz and glam, but honestly, most kids just want to be kids, and they couldn't care less about award shows and red carpets. Which seems to be exactly how Blue Ivy seems to be feeling in the pic above, and no matter what mom Beyonce says, it's not making her feel better. Just like Katie Price, reality star Farrah Abraham has also been known for her rather controversial parenting skills. 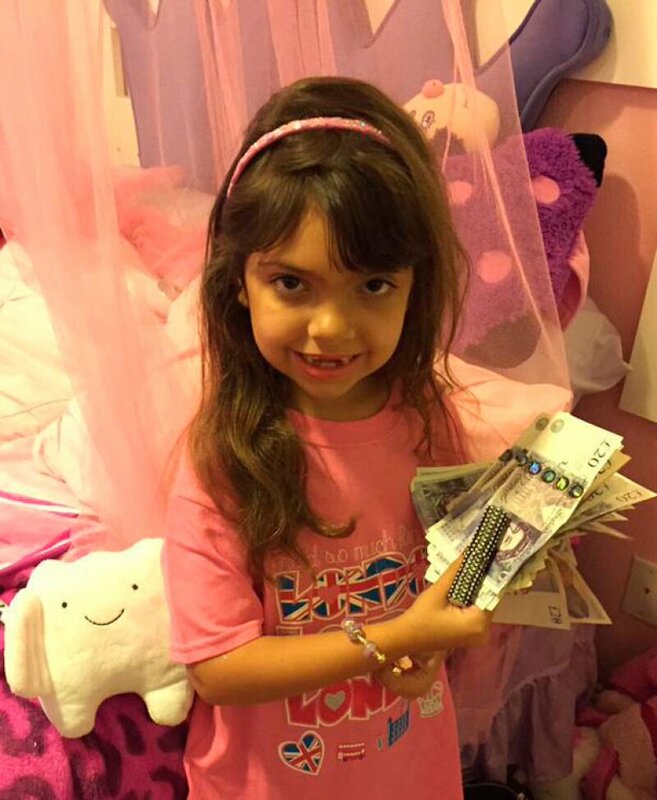 Like when she gave her daughter... sorry we mean the tooth fairy gave her daughter Sophia a whole lot of money for her tooth loss. Now a few dollars does no harm, but this much money? Seriously? That makes the child think money is easily made and grows on trees and that totally qualifies Farrah for this list of hobby celebrity moms! If you thought the pic of Kim Kardashian ignoring North's fall is pretty bad, it has nothing on the late Peaches Geldof full-on falling over her baby stroller back in 2012. Luckily, her son, who also fell out of the stroller during this fiasco was fine, but we can't help but notice how Peaches kept holding her phone because well... priorities, right? Any millennial might agree. To all the moms out there: strollers can be tricky so be careful! We absolutely love Pink, and she is in no way a bad mom. She raises her kids gender fluid and allows them to be creative and grow in their own way. But when she shared this pic on her social media, we couldn't help but worry. Honestly, fire and hot food so close to a little baby is no good, and Pink should know better. You can bet this photo got all the social justice warriors out there riled up and the comment section was heated! Reality personality Kate Gosselin has been under fire for the way she treats her kids. We’re not quite sure what she’s trying to do here. It looks as though she is trying to shush him, but it all seems a little much. She seems aggravated and looks to be acting out of frustration. Regardless, showing your child respect from the day they were born should be the only way to do the whole parenting thing… and this may not be the right way to go about it. It seems like the Kardashians have a thing for kinda forgetting they have a kid. We saw Kim, and now here's Kourtney smashing a car door into her daughter Penelope's poor face. Ouch! Definitely not something good moms do. But yeah, we get it, accident's happen, and for us mortals, usually there are no witnesses. For celeb moms, however, everyone and their mother is watching. Kourtney, next time carefully open the car door and let your child go in first! Reality TV star Leah Messer is clearly another celebrity hobby mom because look at what she's doing while driving a car with her kids in it? Texting and driving is absolutely never justified, but especially not when your kids are sitting in the back seat. Besides giving them an incredibly bad example, Leah is also putting their lives in danger, and no mom should ever deliberately do that to her kids. Leah, you most definitely deserve a spot on this list! 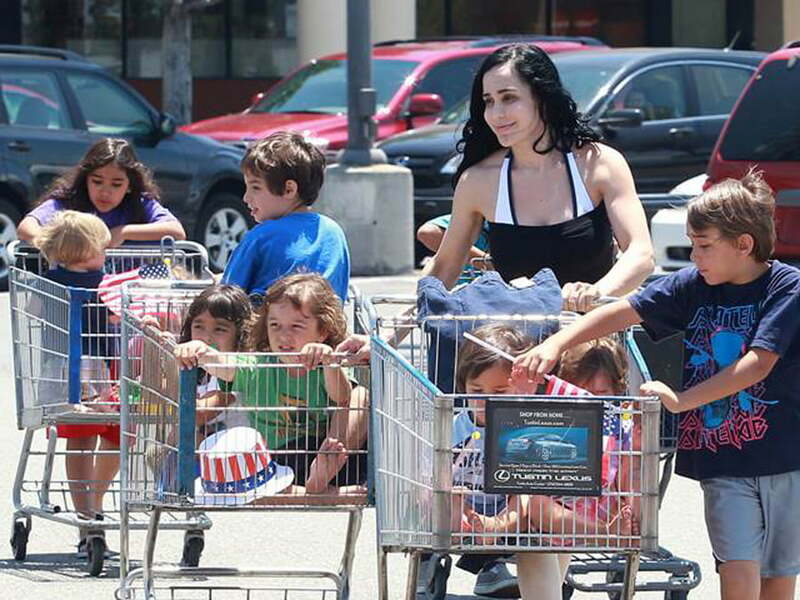 Octomom Nadya Suleman became a celebrity pretty much all because of her kids, and while that's all cool, why on earth is she taking this many of them grocery shopping? It's not safe to have them ride like that in shopping carts pushed by their siblings. Besides, wouldn't it be a whole lot easier to shop without having to think about where your kids are and count them all the time? Nadya, please get a nanny and go shopping on your own! We love Hilary Duff, but why on earth would she post this selfie where her son Luca is clearly upset? Besides, what kind of mother ignores her crying child and keeps taking selfies? Seriously, we are kind very surprised, we did not expect this from Hilary. Okay, maybe it's a bit much, but hey she got a whole lot of social media backlash so we're definitely not alone on this one. 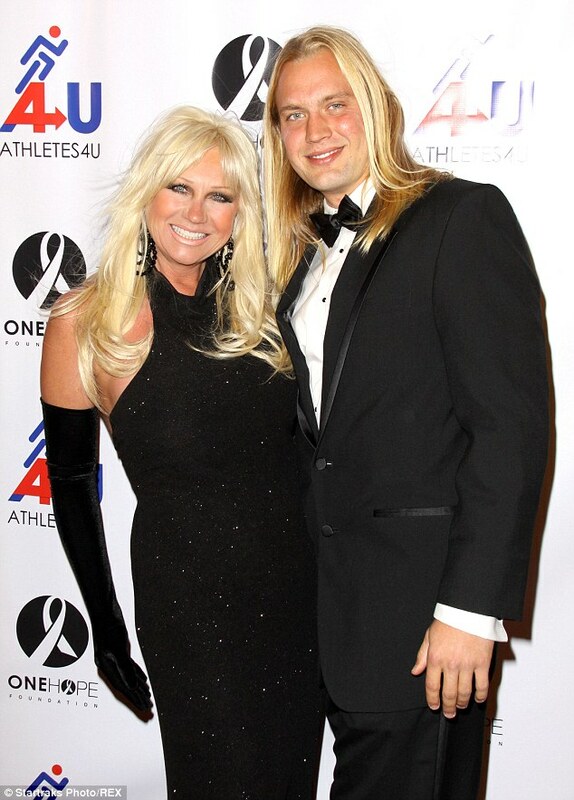 Yeah, at first glance - unless you're a Linda fan you might not understand what is wrong with this photo? Sure she's with a younger guy, but for all you know, that could be her son right? Well, nope. A big nope, because that is her son's best friend Charlie Hill whom Linda was dating at the time. Which is why she brought him to an event. Yup, now you understand why Linda is a hobby mom on this list - dating your kids' friends is definitely a big no-go! We get it Heidi, you're a model, you're pretty much born in high heels, but maybe not letting your (at the time) four-year-old and ten-year-old wear them would have been a good idea? Seriously, those heels are way to high for a little girl, and they sure can't be comfy. Not to mention the harm they are inflicting upon the poor kids' feet. Kids need stable and healthy shoes, not fashionable ones. At least wait until they are 16 or so and their feet have stopped growing. If you think Lindsay Lohan is a big party mess, let us tell you, she's got it from her momma. Dina Lohan frequently parties with her daughter, which results in paparazzi pics of both of them barely knowing where they are, struggling to walk and just giggling all the time. Now we're not saying partying with your child is a bad thing, but if your child is Lindsay Lohan, maybe you shouldn't support her party lifestyle considering what she's been through. Brooke Mueller is another hobby mom who definitely deserves her spot on this list because her kids are pretty much being raised by Denise Richards. Yup Denise had custody over Brooke Mueller and Charlie Sheen's twins, and we bet those kids were super confused. Let's hope Brooke is trying better, and hopefully, her kids won't be too affected by this. 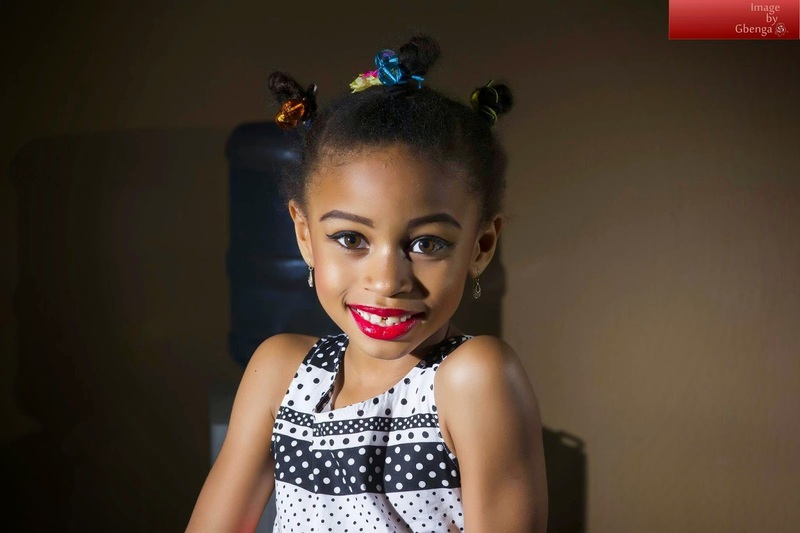 Nigerian actress Ibinabo Fiberesima can totally join Katie Price on this list because she let her daughter wear very bold makeup for a photoshoot - a red lip and cat-eye winged eyeliner! How do their moms look at their young kids and think this is okay and acceptable? We are totally up for allowing your kid to explore the world makeup - whether it's a boy or girl - but maybe not a full face of it. Speaking of kids and makeup, Jessica Simpson's daughter Maxwell made it onto the list as well. Yup, the six-year-old is allowed to occasionally wear some makeup, and mom Jessica seems to be quite proud of that. At the age of six, it is still quite early, even if it's just a bit of tinted lipgloss, eyeshadow and blush. Makeup is fun, but kids shouldn't feel like they need to wear it. Whoohoo, another kiddo red carpet appearance they dislike. This one is featuring Jennifer Lopez and Marc Anthony's son Maximillian, who unlike his twin sister Emme, was not up for any of this, and pretty much threw a tantrum on the red carpet. Jenny had to do a lot of talking and calming down, and eventually, it worked, but was it all really worth the hassle? Celebrities need to stop forcing their kids to do these events, no matter how much the rest of us want to see them. Okay, now you're probably wondering what on earth did Chrissy Teigen do to end up on this list, she's like everyone's favorite mom who breastfeeds in public and is totally openminded. But when Chrissy posted this innocent pic of her and daughter Luna and her on a slide, she got a ton of negative comments, Moms everywhere scolded Chrissy on how she needs to be more careful with her daughter's leg placement, as she could get hurt. A bit much, but still good enough to make our list! Before Heidi Klum did the whole high heels with kids thing, Katie Holmes explored that with her and Tom Cruise's daughter Suri. Suri was spotted wearing tiny heels around New York a bunch of times, and while the heels weren't as big as Heidi's kids, Suri was spotted in them way more often. And allowing your child to walk in heels often, at such a young age can be unhealthy for the development of their feet and soles. Everyone's favorite diva Mariah Carey was ready to accept her walk of fame star, but her son Moroccan was so not up for it. Yup, the little guy made a huge scene, cried, screamed, pulled at mommy's dress, but you know what Mariah did? She ignored him hoping he'd finally get pulled away by someone, and she just kept posing. I mean, you do get a star on the Hollywood walk of fame only once, but your kid is always there right? Wrong, sorry Mariah! Okay, so we kicked the list off with Kim and we figured we'd close it with her mom, the most famous mommager on earth, Kris Jenner! Now it's debatable whether she's a good or bad mom. Some don't like her for exploiting her kids the way she did and making money off their careers, others think its genius. All we can say is that she was suspiciously excited when Kim did an "out-there" photoshoot, and something tell's us her reaction is such a hobby mom thing!